I want to dedicate this Valentine’s Day post to wine, making bad dates slightly more bearable for decades. While I’m drinking far less these days (too much work! ), I do try to enjoy a glass of wine at least on the weekends. One of my favorite things about living in Buenos Aires was the wine! In a country with a 20% percent VAT and ridiculous prices for everyday items (a normal-sized, low-quality stuffed animal = $40, a blender = $80 ), I rarely felt I could buy many luxuries. Yet good wine was one thing you could always get for cheap. It was easy to grab a great bottle of Malbec from the store for $5. The most famous region for wine production is Mendoza. I visited Mendoza with my family over Christmas. 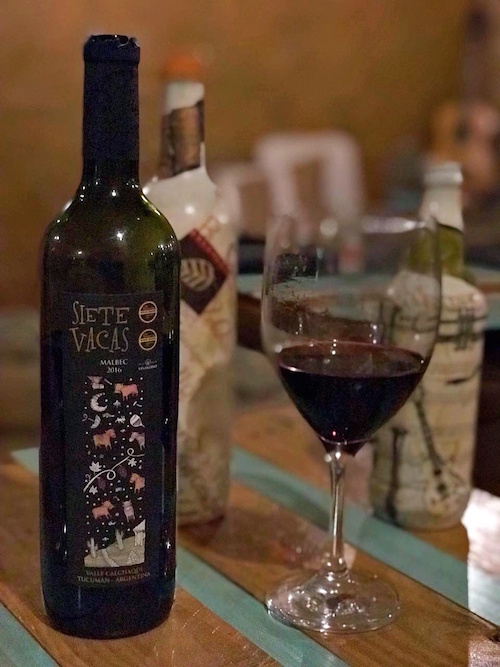 We didn’t make it to many wineries but we did drive down to Valle de Uco (wine road) one day and visited Bodega Salentein. Saletenin is a monster winery. It covers 121 acres and has more than 5,000 barrels of wine. 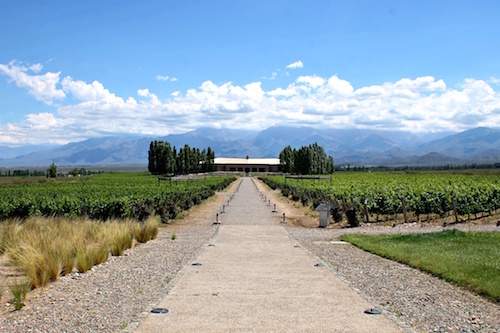 Ninety-five percent of Argentine wine is produced in Mendoza. There are something like 900 bodegas in the region. Despite Mendoza’s fame, I actually preferred the wine from Cafayate. 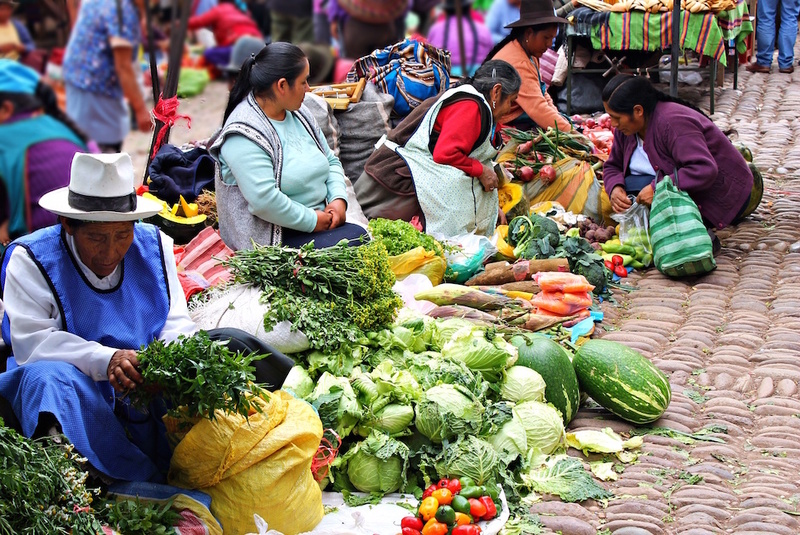 Cafayate is a town of around 12,000 people located a few hours south of Salta. 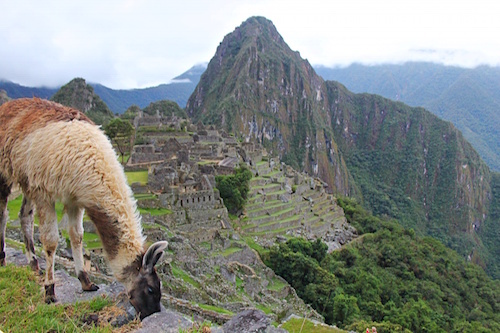 It’s by far the most beautiful place I have seen in South America. 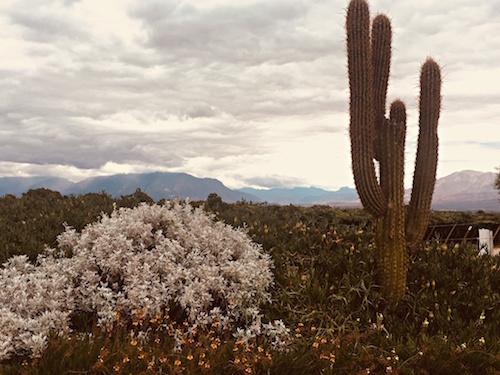 You can read about my 30-mile bike ride through the desert here. 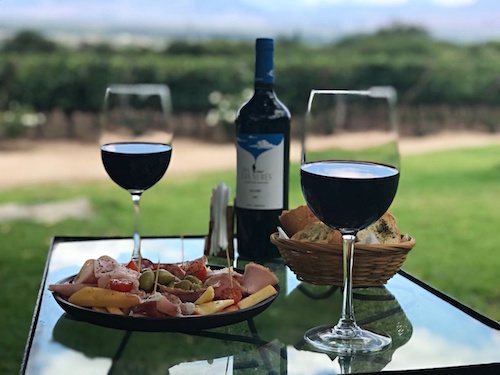 Cafayate is different than Mendoza in that most of the wineries are artisanal or boutiques (the labels depend on how much wine is produced each year). The tours were also considerably cheaper. 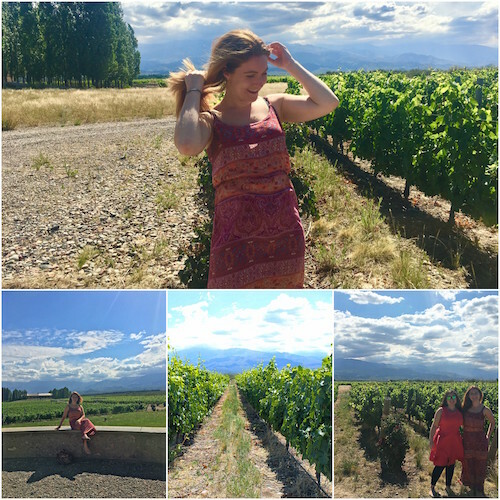 At Salentein we paid 300 pesos per person (~$15.70) for a tour plus a tasting. 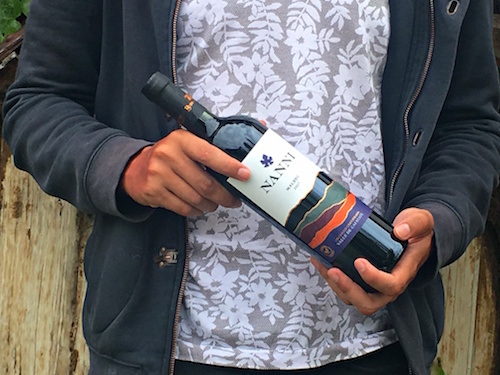 At Bodega Nanni in Cafayate, we only paid 50 (~$2.60) for the tasting and the tour was free. I liked the small-production and laid-back vibe of these bodegas much more. Plus, there was no need to make reservations in Cafayate. 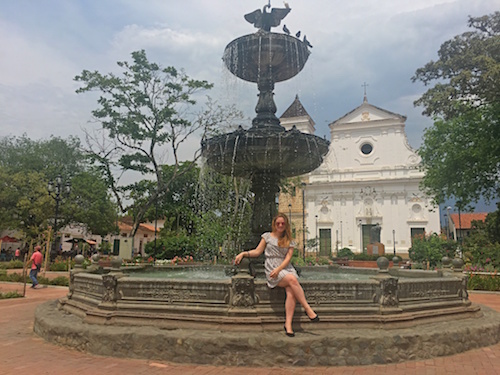 We simply showed up to both Bodega Nanni and Finca Las Nubes in the afternoon. The Nanni Malbec was slightly “spicy” (I’m real good with wine words) and less smooth than Mendoza wines but it was one of my favorites. Finca Las Nubes was by far the prettiest winery I visited in Argentina. It’s located outside of Cafayate so you can take a taxi (about 10 minutes), or you can walk (about an hour). We decided to walk back and someone actually stopped and gave us a ride for free. 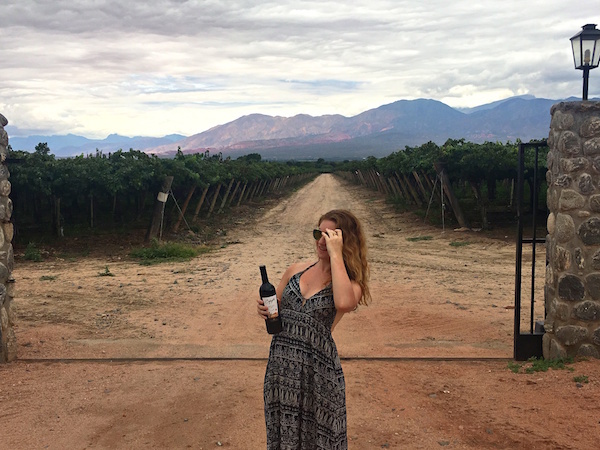 My family’s favorite Argentinian wine is called “Cafayate” from Bodega Etchart and is aptly located in, of course, Cafayate. The Malbec runs about 100 pesos (~$5) in Buenos Aires. The bodega isn’t open to the public but we walked about 40 minutes to get a picture and buy some wine outside. It’s a nice walk through many vineyards and with stunning mountain views. Unfortunately, I can’t seem to find any here in Colombia but I haven’t been looking very hard. My mom hasn’t had much luck in North Carolina, either. Malbec quickly became my favorite wine while living in Argentina. So what makes Malbec special? Well, I’m far from a wine connoisseur. When asked what fruit tastes the Malbec had I said, “grape.” For me, I like Malbec simply because I’ve never had a bottle I disliked. However, I’ve been told it’s known for flavors of blackberry, cherry, and plum. It’s great paired with meats and cheeses. 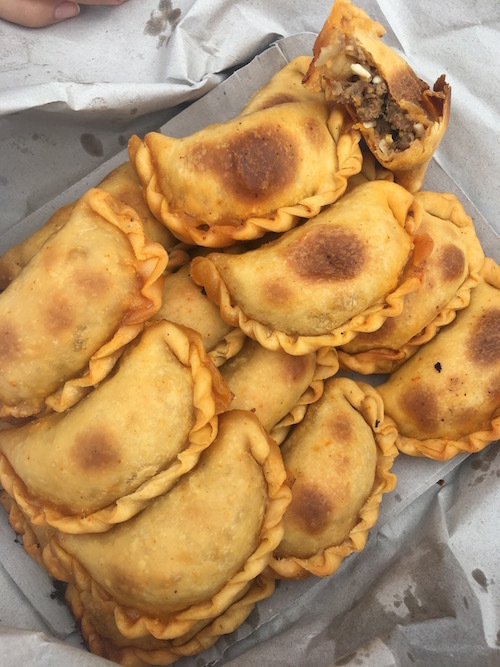 Or, if you are really hungry and you send Damian out for lunch, it also pairs just fine with 18 meat empanadas. Not complaining! If you can’t drink red wine, there is another wine only produced in Argentina called Torrontes. I’m not crazy about white wines but I enjoyed it during the tastings. Again, taste for hints of apricot and peaches. So, if you are constructing a slapstick Valentine’s date night and need some wine— look for the Argentinian Malbecs! 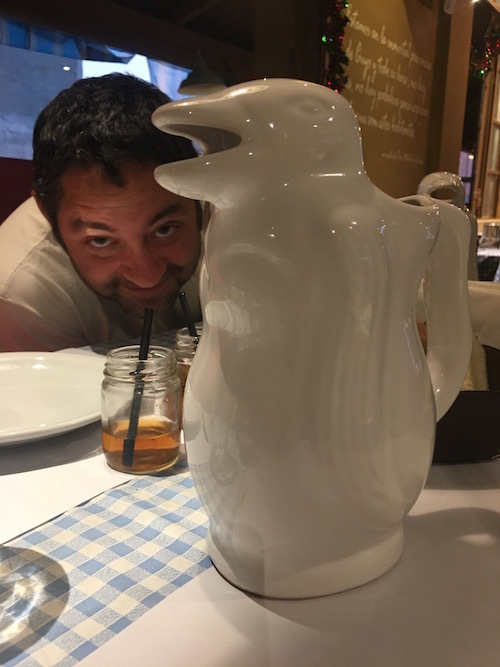 Traditional restaurants will serve wine in penguin pitchers! Missing my Cafyate! And empanadas! Good blog post, as usual!